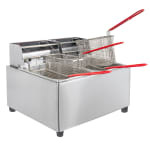 The Cecilware EL2X15 has dual fry tanks that each hold 15 pounds of frying oil and are removable for easy cleaning. The countertop design and non-slip feet let this fryer fit easily into the smallest kitchens, making it a great solution for frying smaller batches of appetizers and specialty sides. The thermal overload device prevents the fryer from overheating, preventing damage to internal components. "I use this product for on site catering jobs where there is need for fried items. I like the dual vat capability and seems to be easy to clean an..."
"I use this product for on site catering jobs where there is need for fried items. I like the dual vat capability and seems to be easy to clean and restore."